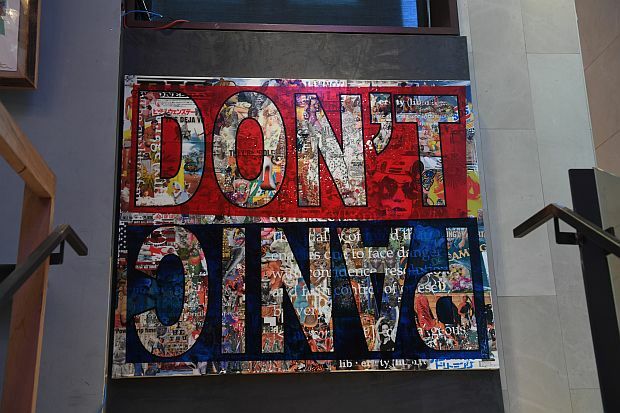 DON'T PANIC by Peter Tunney, at NKPR's IT House x Producers Ball lounge at this year's Toronto International Film Festival. dk: You paste more than paint a canvas. Why is collage, an underrated art form, your medium? pt: I remember watching an interview with Damien Hirst during in which he dismissively said something like, “What? Do you think I have time to sit there and glue two pieces of paper together?” I’m paraphrasing, but I think that says a lot. That’s where I live: gluing two pieces of paper together, deciding on their spacing, their relationship to the rest of the collage and painting. Don’t get me wrong. I think Jeff Koons’ giant balloon dogs are engineering marvels, but personally, I live and die in the thousand little compositional decisions measured on a scale of inches and centimeters. dk: What inspires your compositions? pt: I get this question a lot. I think most artists do, and most are frustrated by it – for different reasons. I am almost daily overwhelmed by inspiration, by the incredible amount of stimulus getting beamed in from all directions. I always say that I’m busy for the rest of my life. I’ll never get to make all the things I want to make. When it comes down to it, and if I’m very, very lucky, I’ll be privileged enough to make another thousand things, work on the philanthropic endeavors and art projects that are near and dear to my heart, and then die. And that is a happy way to go. That’s where my gratitude comes from, just being able to make my way through life creating art. It’s beyond my wildest dreams. dk: You have used pieces for the New York Times in your paintings and other found objects. How do these everyday details inform the work? pt: I love newspaper headlines, old books, the dictionary, all the assorted ephemera that comes in and out of our lives on a daily basis. What happens to all this printed stuff? In a world where everything is on an iPad, what happens to all the old books that are out there floating around? I sometimes use old school movie posters from the 60s, 70s, and 80s of films most people today will never see. But someone put a lot of time and effort into making that film once upon a time. dk: Is there a message behind the mass of images? pt: I really like to see how all the items and references in the collage bounce off another person’s nervous system. I’m not really trying for a theme or a specific meaning. A lot of imagery re-appears over the years: architecture, old advertising, news headlines, old Hollywood, science and nature, pin-up girls. But I’m not trying to provide answers with my work. I’d rather provoke questions. 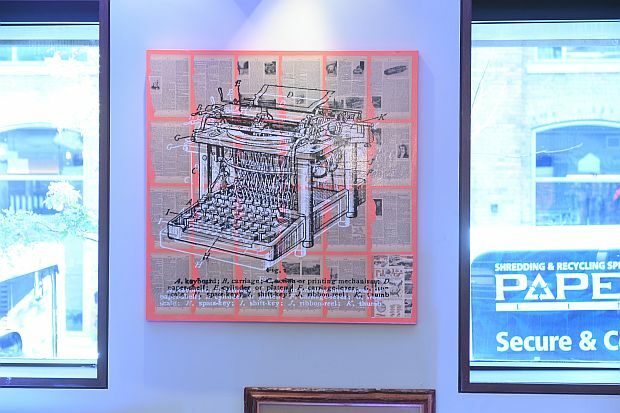 What does it mean to have a painting with “EVERYTHING IS OK” written large on a collage of headlines describing death and destruction and political impasse? Maybe it is OK. Or maybe we’re kidding ourselves. But what do you think? 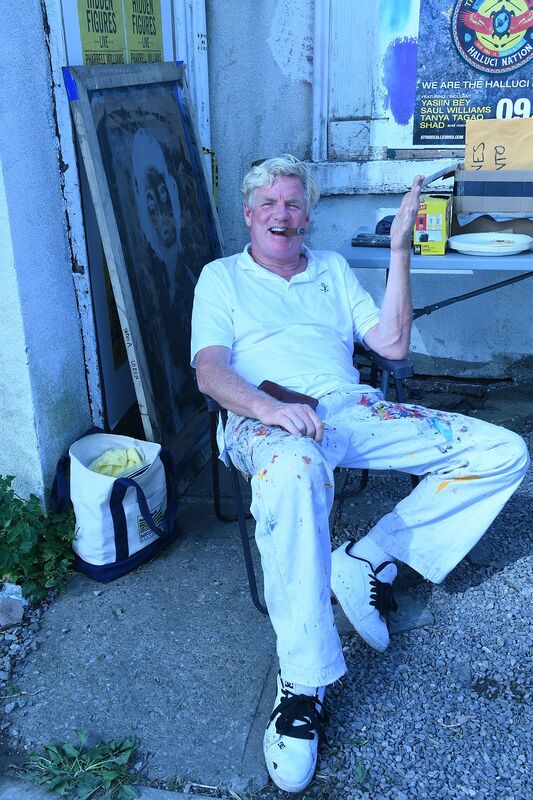 dk: I think that you have revitalized Pop art, which came of age in the 1960s, making it speak to issues of the day. Is that what you have set out to achieve? pt: I don’t necessarily refer to myself as a Pop artist, but it can be an effective shorthand. To me, it just means that I’m looking outward into the culture and interacting with it. All the Abstract Expressionists turned inward in the wake of WWII and then Andy Warhol came along in the 60s and said, hey wait a minute, there’s also this big world out there. There’s TV in every house and advertising getting beamed into everyone’s head. What does it mean for art and for society? dk: You started your career on Wall Street and then became a gallerist, representing photographer Peter Beard before making art yourself. How did those earlier experiences inform the person you are today? pt: You know, it’s kind of like I went to a party when I was 13 and came home when I was 43. Those years at the Time Is Always Now gallery were indeed magic and crazy and just an utterly breathless existence. But that party necessarily came to a pretty abrupt end. Somehow, I survived to the other side to tell the tale. Today, I’m just not interested in trying to chase that lifestyle. I’m interested how to express my gratitude for this extraordinary life, how to be of service, how to be a better husband and father. I want to work on projects that I love and find meaningful. It’s not that it’s a quieter life, but it does have a completely different orientation. dk: Besides New York you show in other North American cities like Miami where you are among the first to have a gallery in the Wynwood art district. How has the area developed since you set down there in 2010? pt: The late, great visionary Tony Goldman, who pioneered SoHo in New York City and revitalized South Beach in Miami, came to me one day, six or seven years ago, and said that he wanted to create a new kind of community. He wanted to take a largely abandoned warehouse district on the mainland, anchor it in large scale, world-class murals and graffiti art. He said, “I have my town center, it’s called the Wynwood Walls, and it will be a spectacular outdoor museum for street art, but I need a beating heart, someone to come down to Miami, bring the sunshine and energy, be the beating heart.” I said, “Where do I sign?” We leaped off the cliff of optimism and haven’t looked back. 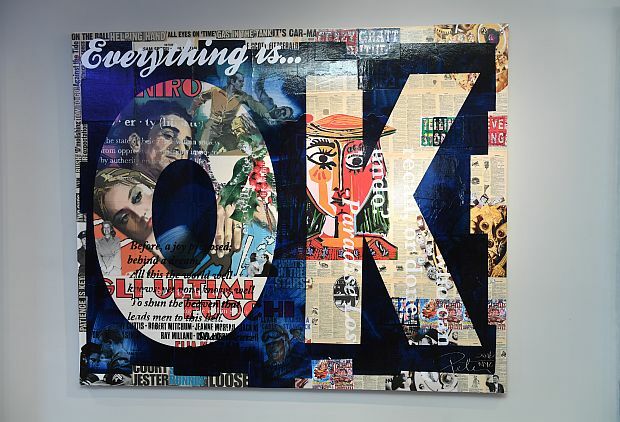 Everything is... OK by Peter Tunney. dk: What’s the scene like now? How have you contributed to Wynwood’s growth? pt: Today, Tony’s daughter Jessica is the CEO and is every bit her father’s child. She’s a visionary in her own right, and an exemplary leader. It’s been such a privilege to work with her in Wynwood, a singular place on the planet for seeing and experiencing street art in all its forms. Around 100,000 people come to Wynwood every month. My gallery alone has 15,000 people passing through the doors each month. It’s a sign that people have really come to understand what a unique and special place Wynwood has become. It is actively creating the next generation of art lovers. I think it’s just a very special place in the cultural landscape. dk: You set up shop at the NKPR IT House at TIFF this year. What has the experience been like? Have you done anything like this before? pt: I’ve known NKPR CEO Natasha Koifman for a long time. We’re both on the board of Artists for Peace and Justice, filmmaker Paul Haggis’ charity, and together we have been supporting APJ’s work in Haiti for the past eight years. After the earthquake, we decided to double down and re-commit to Haiti. We purchased seven acres of land, and built in excess of 70,000 square feet of classroom space. Today, we have 2,800 of the poorest and most deserving students in Haiti receiving a serious and life changing secondary education on full scholarships. I’m very proud of that. We’ve always done some kind of activation around TIFF – we do a fundraising dinner that annually raises more than $1-million for the cause – but this year we decided to really go for it, bringing up a full show of new, collectible artworks and opening up a shop during TIFF. It was almost like a residency. I was out in the street pulling silkscreens, making art. People gathered around to see what was going on. It was a great time and we donated 50 percent of the proceeds of art sales directly to APJ. And Natasha’s whole team at NKPR is stellar. They’re an amazingly effective and fun group of people to work with. I had a great time. dk: I saw you at work on Toronto’s streets and you were so exhilarated you shouted out loud that you wanted to come back to open a gallery here. Are you really going to do it? pt: Well, I’ll just say that I fell in love with Toronto and think that it is just ripe for something. I’m going to stay, explore, and see what makes sense. But Toronto is a fantastic city. It’s North America’s seventh largest, the same size as Chicago or Miami. I’m not saying we’re going to try to create another Wynwood. But we’re going to something monumental and wonderful and see if we can light up this city in a major way. Stay tuned.